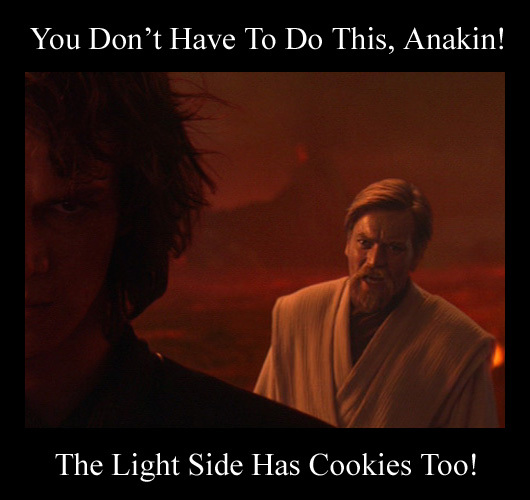 I apologize if you read the title to this post and immediately thought “oh yes, the opposite of the Dark Side. Why is he going to write about Star Wars”. Well, I’m not. Although, now that I have said that, I remember just the other day seeing that there has been an official date announced for the movie release of the 7th installment of the epic Star Wars series. I don’t remember the date exactly, but it’s irrelevant to the conversation we are about to have here. This announcement has me a little bit excited, I must admit. I’ll even go so far as to say, it’s given me A New Hope. Why, you ask? Well, it can’t get any worse, can it? I think we can all agree, that the last couple of films weren’t quite up to snuff; particularly when compared to the epic original trilogy…and to some critics that might be putting it lightly. So, as they say, “it can only go up from here!” This is such a great positive way of thinking isn’t it. Typical glass half full mentality. Move past being ashamed and get on with it. Things often happen when playing football that can be quite similar. Moments where you can only smile and laugh at the situation. Moments where The Empire Strikes Back, so to speak (alright maybe that’s a stretch, but it will get worse before it get’s better). These moments are what we will refer to here as The Light Side. The classic light side example is what I have come to know as The Sniper. Essentially, what happens is that the someone is running at a gallop all alone and they proceed to trip and fall over – usually to the delight of all, but particularly the delight any opposing fans who might be around. It is quite comical, especially when performed to a high standard. It’s as though…wait for it…someone used the force to make them trip. And, of course, for those of you who don’t believe in the force, the sniper imagery works well too (minus the gore – usually). Look, we all know that it’s funny until someone get’s hurt, then it’s hilarious! Well, that is sometimes true in footie as well. It’s terrible to say, but sometimes you can’t help but laugh when a guy gets hit in his groin area. This sounds so bad, I know, but I promise I only laugh as I’m running over to check he’s going to be alright. Once I was playing and the same guy was on the receiving end of this cruel punishment twice in the matter of 10 minutes. He had only just recovered and returned to the game! It was, indeed, an unfortunate case of The Return of the Jedi (I warned you it would get worse). There are also crunching tackles that at times send someone flying, especially smaller players…like myself. This is sometimes called getting “bodied”, or “weighted”, and more often that not leads to shouts and jibes of the “Get in the gym!” variety. Vain attempts at trickery can also be met with the inevitable shouts of glee and abuse! I once had a teammate go for a flying overhead kick, which he missed terribly and proceeded to fall awkwardly on his head. It looked bad, but after our immediate concerns were alleviated, the laughter commenced and we didn’t let him forget it for quite a while. Miss-kicks, in general, are very common Light Side moments. Whether it’s someone missing the ball completely, or someone hitting a shot so poorly that a it goes out on the sideline rather than the end line, these events are always met with jibes from all quarters. The equipment can even play it’s role in providing a laugh at times. I’ve seen people – and, in some cases, been the guy – who get caught in nets, run into posts, slips on cones, or pokes themselves with a corner flag. In one training session, a team of mine was using these training poles as markers. The poles are about 4-5 feet tall and can be used for just about anything from a goal to field markers. On this particular day, we were using them as opponents for a shooting drill. We essentially had to touch the ball around these poles and have a shot. In a matter of 15 minutes, we had broken three of them! After the first two broke the manager was getting annoyed and questioned our clumsiness, but when someone stepped back onto and broke a third minutes later, no one could avoid a good laugh. Although there are special cases where it is in fact the human. The Phantom Menace that haunts all players in the game, is the own goal. There are two types of own goals. Those that are clearly incidental (for instance, a shot that is going wide deflects off of a defender’s body to go in) and those that appear intentional. One day in training we were working on our free kicks; one team attacking and one defending. On one of the plays the ball came loose and one of the defenders emphatically smashed the ball home into the goal, and raised his fist triumphantly. We all looked at him as if he were crazy and the bewildered and irritated coach asked him what the hell he was doing? He legitimately thought he was on the attacking team. Yea, maybe the Attack of the Clowns! After the coach berated him for his lack of focus, we all had a good laugh at him and will enjoy chatting about that moment for years to come! Pardon the slight overuse of Youtube on this particular post, but the plethora of ridiculous videos is too easy to get my hands on and so amusing. Little bloopers like this happen quite often on the field, sometimes they are caught on camera, and other times they aren’t. Frequently, they are “had to be there” moments, so I apologize if that is the case for some of my stories here. The main point; however, is that there is plenty to laugh about despite all the Dark Sides of football. Kind of just like life, I guess. If you can’t appreciate these moments, then chances are you’ll be a pretty miserable person. Unfortunately, I couldn’t manage to sneak in the last Star Wars title into my post, so here you are: “Revenge of the Sith”! Had to fit that in somewhere. All the best, and don’t forget to appreciate the light side of life.